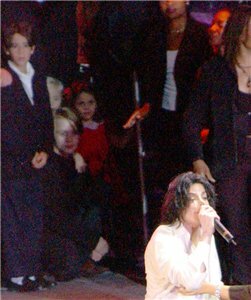 Prince and Paris Jackson's godfather Macaulay Culkin takes care of Michael Jacksons kids at MJs 30th. . Wallpaper and background images in the Prince Michael Jackson club. This Prince Michael Jackson photo contains business suit. There might also be concert. Can you see where Macaulay Culkin, Paris and Prince is?